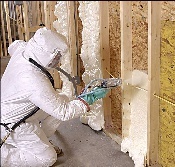 At Spray Foam of Maine it is our goal to not only provide exceptional service and products for our customers, but to also provide necessary information on Spray Foam Insulation for our customers to aid them in making an educated decision regarding Spray Foam products and services. The links provided here have been compiled from numerous trade organizations, material providers, and industry white papers. There is an abundance of information provided here, and we hope that the majority of your questions can be answered. However, please feel free to contact us with any further questions or concerns that may arise during the selection process.